Type that into google Maps and Sophia, our travel trailer, is within 50 feet of that spot. Also called Goose Point on Phillpott Lake in southwest Virginia. A common metaphor used to describe the strange complexity of chaos theory is that of a butterfly beating its wings in Tiananmen Square in Beijing (39°54’26.4″N 116°23’27.9″E) causing a hurricane in the Atlantic Ocean. It was two months ago that we knew we would be in Greensboro, North Carolina, on August 12. With that deadline our itinerary developed some fixed points: seeing family and friends along the way (Ellensburg, Spokane, Albuquerque.) From there our stopping points were chosen because of time and distance. At least six of those places had markers of great national importance or of tragic events. We had not anticipated these experiences when we sat down to plan our journey. The butterfly is beating its wings far away. We had stopped for a day in Amarillo, Texas when we discovered that our awning would only roll out about 3 feet before jamming. We tried to schedule repairs in Oklahoma City, Little Rock, Arkansas, and in Memphis, Tennessee. All to no avail. The butterfly is beating its wings. 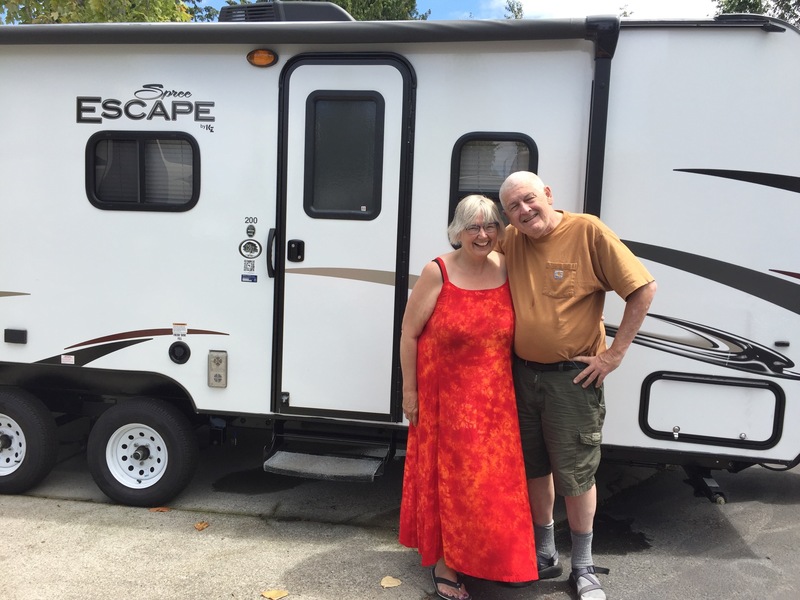 When we were in the Great Smoky Mountains in Tennessee we located a dealer (Econo RV) that sold our brand of travel trailer. He said we could bring Sophia by and that he would take a look at the awning. That dealer was in some small town (Bassett) in southwest Virginia (about 90 miles north of Greensboro.) The butterfly continues to beat its wings. Diane found a US Corp of Engineers campground 20 miles from the dealership. She reserved a spot for two days for us in case we had to wait for the awning to be repaired. It’s a common experience, whether it’s a doctor’s visit, an auto repair or a call to the plumber, that the problem you bring to their attention disappears when they take a look at it. The awning unrolled and rolled back in repeatedly just fine. The butterfly has not stop flapping its wings though. At the end of our first day here at this campsite we extended our stay for two more days. Midway through the second day we extended our stay here for another week and a half. This camp is achingly beautiful, still, secluded, and entirely restful. For the first time in weeks, months, or longer we have stopped and are at rest. Seattle, Ellensburg, Spokane, Missoula, Dillon, Brigham City, Moab, Albuquerque, Amarillo, Oklahoma City, Fort Smith, AK, Little Rock, AK, Memphis TN, Nashville, TN, Great Smoky Mountains, Tennessee, Greensboro, North Carolina. The first 25 feet is a slow slide . . . The first 25 feet is a slow slide down the gravel, the brakes are a whimsy. We come to a stop and face the reality that the only direction we can take is to keep going ahead. In 1976 an old and dear friend of mine, Susan Morris, taught me that there are always more than two options. Life is not binary, she said. That dictum has served me well through the last 40 years. I believe it, I trust it, I say it a lot. There are always more than two choices. And sometimes there are less. We took off this morning from the Great Smoky Mountains in Tennessee, on our way to the last stop on this leg of our journey: Greensboro, North Carolina. We drove a few miles and the Voice of Google Maps told us to turn right. The sign for Interstate I-40 said turn left. We had a few options there: go left, go right, take another look at Google Maps. We went right. We drove for two miles and the Voice said “turn left at the next road.” The sign on that road said “no trucks, GPS is inaccurate.” We had a few options there: ignore the sign and turn left, keep on going or turn around and go back. We kept on going. After a couple of more miles down the road the Voice said “turn left at the next road.” The same sign was there, the same choices available for us. We kept on going. In about another mile the first sign we saw said “in 11 miles this becomes a gravel road, no trucks allowed.” The second sign said “for the next 7 miles the road will be very, very curvy and narrow.” We kept on going. Stunning beauty, verdant green on both sides of a very, very narrow mountain road; steeply falling off on one side. In the next 7 miles we saw one vehicle coming our way. Slowly. After about 7 miles, the Voice said “turn left at the next road.” We stopped and, finally, pondered. The road to the left was actually a very steep gravel one lane road. Google Maps said that in a mile and a half this “road” will connect with interstate I-40. For the last 7 miles we have been traveling on one of the narrowest two lane roads that we had ever driven and especially while pulling a 21 foot travel trailer. There had been no place to turn around and go back the way we had been coming. There seemed little hope that this would change as we continued to climb towards what would become an unpaved road. We turned left and began our slow slide down that gravel road. We stopped at a flat spot 50 feet down, there are a couple of feet on either side of our truck and 21 foot travel trailer; bordered by a ditch, the slope continued pretty steeply on down to a curve that we couldn’t see beyond. inches on either side of the trailer. that goes steeply downhill with sharp curves and little room on either side of the trailer. Diane leads the way almost the whole time for the next mile. There are always more than two options, except when there are fewer. I walk somberly with others on the 2nd floor of the Lorraine Motel in Memphis. I see the room where Dr. Martin Luther King, Jr. stayed and his suitcase with a copy of Strength to Love in it. I look out the window to the balcony. A wreath marks the spot where he was assassinated on April 4, 1968. There is a spirit here that transcends any history I’ve ever read out of a book. I continue through the museum. I watch the videos of fire hoses and police dogs in Birmingham and the forces of resistance across the country through strikes, marches, sit-ins and school integration. And the adults and children who were battered and beaten. And those who were killed. “Either we go up together, or we go down together.” I mourn. I am quiet that night, reflecting on the power of resistance. The next day, the power of music as resistance becomes clear. The Blues Hall of Fame in Memphis holds recordings of musicians who were born on plantations, musicians who came from sharecropper families, musicians who crossed racial lines to create new sounds reflecting their own times and places; who sought ways to make sense of our world through the blues. The historic Beale Street in Memphis, created in 1841 but peaking in the 1920s, was a complex and changing place. In the beginning, most of the shop owners were white, utilizing the Mississippi River for trading. In the 1860’s, Beale Street became a gathering place for blacks across the South with many musicians playing there. But, only whites were welcome to play at the city’s Overton Park and the zoo there was open to blacks on only one day of the week. Robert Reed Church, Sr., the freed slave of a riverboat captain understood what it was to be excluded. As a wealthy African-American businessman, he created Church’s Park and Auditorium on Beale Street in 1899 to provide a place for the black community to meet, listen to music, swim, and enjoy recreation. By the early 1900s, many more African Americans owned businesses along Beale Street. Church’s auditorium was renamed Beale Avenue Auditorium. The picture below is of the pool built as part of Church’s Park so black children had a place to swim. On June 11, 1964, Martin Luther King, Jr was arrested for trespassing at the Monson Motor Lodge after being asked to leave from its segregated restaurant. This (and other things) helped spurn on a group of protesters, black and white, to jump into the pool as a strategically planned event to end segregation at motel pools. The pool at this motel was designated “white only.” Whites who paid for motel rooms invited blacks to join them in the motel pool as their guests. This swim-in was planned by Dr. Martin Luther King, Jr and two associates. The motel manager, Jimmy Brock, in an effort to break up the party, poured a bottle of muriatic acid into the pool, hoping the swimmers would become scared and leave. “Let us realize the arc of the moral universe is long, but it bends toward justice,” said Martin Luther King, Jr. Let us also remember that we each have a responsibility to use the power of resistance to create the kind of change that bends the arc more quickly. Lives depend upon it. The Cherokee described these mountains as shaconage, meaning “blue, like smoke.” The misty clouds dance around them creating an ever changing landscape. The park is home to more tree species than in northern Europe, 1,500 flowering plants, dozens of native fish, and over 200 species of birds and 60 of mammals. A richness of biological diversity and cultures. This post is displaying landscapes. Soon will follow a post about the people and history of this area. The Great Smoky Mountains National Park is made up of 522,427 acres that straddle the border between Tennessee and North Carolina. We entered from the northern area and these pictures are from Cades Cove and the road to Newfound Gap. Enjoy! Rest stop. Allowing time for our souls to catch up to our bodies. “I’m sick of Google Maps,” I said with frustration. My calm partner, driving the truck pulling our travel trailer, looked quizzically at me. “Just once, I’d like to know where something is without having to look it up,” I whined. We’d been on the road for 4 weeks. Newness every day. Wonderful and exhausting. I needed to rest. Along our 2,600 miles of travel, we’ve experienced a wide diversity of rest area stops. They differ in how they are spaced, what they look like, and what they offer. The last thing I want to see when it’s time to rest are rules telling me how to do it. Most often the “voice” of rules comes from inside me, nudging me that I’m resting too long; there is work to be done. When I truly enter a state of rest within myself, it is radically different from my daily life. How radically would my life change if I entered that “state” more often? Rest areas often honor people who have inspired others. When I create quiet time and reflect on those who have inspired me, it strengthens my soul. Sometime, rest areas provide warnings and give you resources to get help. Resting allows me the space to more clearly see what is coercive and threatening to my well being and encourages me to take some bold steps for change. Rest areas are sources of learning whether about history or when the National Banana Pudding Festival is happening. I learn the most in my resting when I allow the silence and time to expand, even when it starts to feel a bit uncomfortable. I’m so used to “doing” that simply “being” often feels unnatural. That, in itself is revelatory. If I am willing to persist in holding the space, surprising insights come. Some rest stops are very minimal, but, so very needed that frills are not necessary. Texas, however, wins the award thus far for an extravagant rest area. Perhaps because it also doubles as a tornado shelter. Perhaps, because Texas celebrates bigness for resting. Even in the midst of grandeur, there are some reality checks. I’m learning to do a reality check more frequently on when it is time to rest. To listen better to my body and its wisdom. There is a story about an American visiting Africa who questions the guides when they insist on stopping after a few days of travel. “We have traveled very fast and must allow time for our souls to catch up with our bodies,” they said. In essence, that is the way we should take life seriously. May we create rest areas in our lives so our souls can catch up and we can be whole again. I was stunned after more than an hour in the Little Rock Central High School Historic Site and Visitor Center. 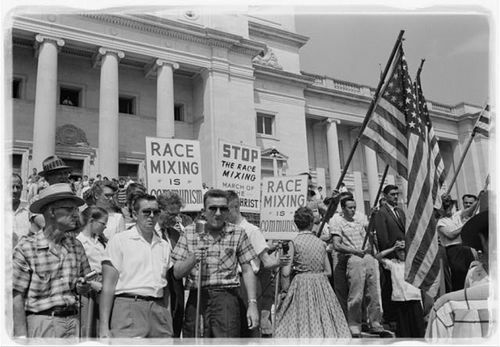 It gave me a history lesson I never fully got in school about the integration in 1957 of an all-white high school by nine African American students three years after the Supreme Court’s landmark Brown v. Board of Education ruling. 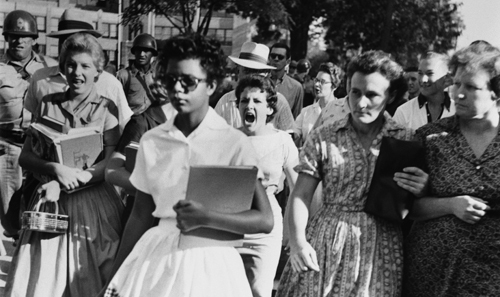 Listening to the stories of the Little Rock Nine, I was both inspired by the students and horrified by the inhumane behavior of white people. However, something deeply disturbing happened as we watched the hourly film showing of Nine from Little Rock just before we left the center. Before the film begin, a park ranger explained that the 1964 short documentary, which won an Academy Award, was commissioned by the United States Information Agency (USIA) as propaganda during the Cold War. I’ve since learned that the USIA, established in 1953, became a critical part of foreign policy during the Cold War using propaganda and diplomacy to positively showcase the United States. Here’s where it gets problematic. If you just see the film and don’t know all of the history, you’d think the integration of Central High happened fairly easily with the wonderful support of federal troops on September 25th. What it completely leaves out of the telling is the horrendous days from the first attempt to integrate on September 4th. It doesn’t show Governor Faubus having the Arkansas National Guard bar the entry of the students. It doesn’t tell about the threatening mobs every day, injuries to reporters, and the protestors spitting, shoving, and name-calling of the students. It gave the impression that, yes, we had a bit of a challenge in America, but we handled it so well. It erases the reality of the challenge of fighting oppression. As we went to leave the museum, the same ranger asked us what we thought about the center. I hesitated, “The center information was great. However, I found the film disturbing.” I explained how people who didn’t know the full history would get a very sanitized version of a horrific time. It didn’t seem right to me to show this film at the center. He asked if his explanation at the beginning of the film was helpful. I acknowledged it was helpful to know how the film came to be made but shared my concern that it continues to whitewash the reality and miseducation people. “Well, I’m glad to hear you say that,” he said, cautiously. He was a Black man. I said I was concerned it contributes to people believing we live in a post-racial world. He then said, “People like you make my day.” I was reminded of the daily cost of whitewashing on people of color. I’m going to write a letter to the National Park Service expressing my concerns. And I’m going to remember the Black park ranger who, day after day, is subject to ignorant and painful remarks from people who look like me, and like me, were never were taught the true history of our country. We were taught propaganda about Native Americans, Black people, Chinese people, Japanese Americans, Mexicans, and more people who were not white.